“It’s amazing how food brings people together” says Sean Brathwaite. 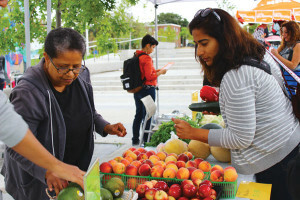 Brathwaite is the Market Manager for the Taste of Regent Park, the weekly celebration of food and culture that happened this summer in the new park at Dundas and Sackville. This event brought together an affordable fresh produce market, cooking demonstrations, locally grown veggies and neighbourhood vendors, all topped off with a $3 dinner prepared by a different local caterer each week. Taste of Regent Park was hosted by the CRC Regent Park Community Centre (CFC), in partnership with the Regent Park Film Festival, who held free movie screenings in the park after dinner for six weeks this summer. It was designed to bring together residents of Regent Park, some living in market condos, other in subsidized units, in a way that celebrated the diversity of the area – all of Toronto in one neighbourhood. With each passing week the event grew, bringing on bike repairs, manicures from Yonge St Mission, and music from local bands and the DJ team at U for Change. By September, the community had gotten to taste biryani, Chinese noodles, empanadas, Bengali shrimp and more, all prepared in the kitchen at the CRC Regent Park Community Food Centre. The Community Food Centre, which offers a variety of programming around food access and food skills, has a strong investment in the new, six- acre Regent Park. A local community group focussed on creating programming in the park, the Friends of Regent Park, meets at the CFC to plan seasonal park events, like Winterfest and October Fun Fest (a Halloween Celebration). The Park Friends have been trained to use the park’s bake oven as well, hosting pizza and bread-making sessions for the community. This outdoor programming furthers the CFC’s commitment to being “A Place for Food in Regent Park” – they offer weekly cooking classes and demonstrations in their brightly lit program space, as well as a free, delicious and healthy breakfast and lunch every weekday. The programs are open to everyone, and invite anybody from the community to come together to cook, grow, share, and advocate for good food.